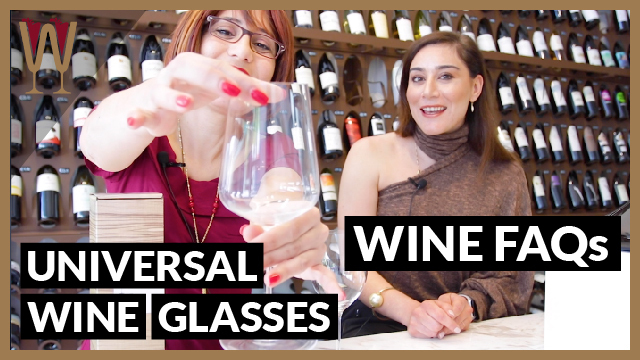 What is the Universal Wine Glass? WineScribble travels to Phiale Wines in Limassol to meet Myrto Tofaridou and find out more about Zalto wine glasses. What is the reason that wine tasters prefer certain types of wine glass shape? Does the shape of a wine glass really matter? Find out more in this video! Enjoy the presentation. Subscribe to WineScribble on YouTube NOW! Hey Tasters! Last night I was tasting some wine with a sommelier friend of mine, and she made a big point about how much the shape of the wine glass affects the aromas and the taste of the wine. I couldn’t believe it, but you know what, we tasted wine side-by-side in two different wine glasses and it makes all the difference in the world. I asked her which wine glass she was using, and I’ve come straight to the source. Not only do I want one for myself, but I need to find out more. So I’m here to talk to Myrto Tofaridou, who’ll explain to me why the shape of the wine glass makes such a big difference to the tasting experience. Come with me. These are the glasses. I can’t wait to find out more about this! Hey Tasters! So, I’m here at Phiale Wines, and I’ve got my wine glass expert here, Myrto Tofaridou, who owns this beautiful wine cava. And Myrto is going to explain to me why it’s so important to have the right shape of wine glass. Now the differences between a wine glass and an ordinary glass are obvious because there is a stem. And the wine glass has, it’s more narrow at the, the bowl, is more narrow at the top. So how does a wine glass and an ordinary wine glass help us taste wine better than a usual glass? This is a universal design for both the white and reds. I mean you can see the difference the stem is thicker the whole glass is thinner. This helps since it’s a lighter weight glass it helps do the swirling better. Which means that when you smell and when you taste the wine it gets out all the aromas and all the tastes. Of course when it’s a lighter-weight glass, you can have a total experience. It enhances the way you taste and you drink wine. This is an excellent choice, I mean the universal model it goes for both white and red. Of course, there is a selection for the Bordeaux’s and the Burgundy’s and the champagnes and the dessert wines. But, this specific design is amazing. We do all our tastings here, it’s been used in most competitions, sommelier competitions. And I think it’s a perfect choice for anyone who wants to enhance their experience in wine and taste wine better. So, this is different, I mean if you can see this, okay? This is thicker, it’s shorter. Of course, you can still smell and taste the wine, but this gives an ultimate experience in terms of wine. And you can hold it and you can see the weight as well. Try it, try to do the swirling as well. Yes this is, even though I’m holding this with my left hand, and I am severely right-handed, this is so much easier to swirl. But also the glass is, though this isn’t glass is it? Crystal? No it’s glass. Yeah it’s hand-blown by the best, the best glass blowers of Austria actually. I see, because it’s much easier to see through it. Through the glass there is no glass distortion, possibly because it’s so thin and clear. People are scared when they hold this, one of these wine glasses but they are so flexible. You can see that there is intense flexibility in terms of the glass. Thinner Wine Glasses are Flexible! Just try and do it yourself. So you can see that it’s a flexible glass. So if you’re ever worried. So don’t worry, don’t be scared, thin glasses are flexible. There you go! So it appears more fragile but there is a secret strength there. And, wine lovers and wine professionals, they love these glasses. They love this glass because it has the opportunity to get into the shape of your hand, so you can swirl and you can move it and you can do the tasting. And it completely makes the experience of wine even greater. Just observing I can see that the rim is narrower for this glass. Yes, because the glass is thinner. Yes, but it’s a it’s a smaller circle, which I guess collects the aromas more? It does collect the aromas, and it does enhances the aromas as well. So why do wine glasses have have a stem? Usually you use this stem, apart from its like it’s very elegant when you hold it from the same. Of course! For me it’s important that you avoid having the temperature of your hands increase on the bowl. Because some wines they need to be served with the right temperature so once you have your hands here. Your body heat will change the temperature of your wine. I see. And I guess you get fingerprints also, all over. Yeah, its not that elegant actually. I would listen to this lady about elegance! How much wine should I pour into my glass to get the perfect amount? Usually what we see when we go around in many restaurants and in many many bars, unfortunately, is that they fill up the glass a very very high point. Usually we fill up the glasses up to here. Because it gives you the chance, and it gives the wine the chance, to open its aromas and open its flavours. And it also gives you time from the wine bowl to arrive to your palette and your taste buds. Once it’s full you cannot reach and you cannot see the intensity of the aromas on the nose. It’s too much wine, it to interact with oxygen. And also when you pour less you keep it at a perfect temperature. When you pour a glass and you put it up to here, at a point if you have a wine for 30-40 minutes in your glass, it will lose the temperature, so it would lose its character. So you won’t be having a good wine experience. So it’s better that you pour less, and you start to do the repouring afterwards. Okay, so less wine and repour, and refill as often as you like. Yes we usually refill up to five to ten times! So guys, this is what we do, five to ten times! So Tasters! There you have it. I’ve learned so much today. Now I know why wine tastes more amazing served in this shaped glass than an ordinary wine glass. If you’ve enjoyed this video, tasters, please leave me a thumbs up! Don’t forget to hit the red subscribe button. And leave a comment with any questions, and if you ask me a question and I don’t know how to answer, I’ll be in touch with Myrto and I’ll get back to you! Feedback is important. Feedback is important, cheers! Thank you, guys! I’ll see you in the next video. LOVE THIS? Click to tweet this video! CLICK THE BELL to be notified when we post new videos. WineScribble is entertainment. Vlog format videos and story-telling with the theme of wine.